It’s easy to get excited about the riot of color on Yellow Island, or the many cultivated flowers beckoning bees right now. But if you slow down, look down, and take notice, there’s a miniature world in bloom too. Here are three often overlooked native beauties I found growing on our mossy knolls – all with very different growth habits. This adorable mini succulent grows from a base of spreading rosettes, sprouting up tall thin stems which support delicate pale pink flowers May through July. The fleshy egg-shaped leaves are evergreen, sometimes with a reddish hue. Also known as Little Leaf Miner’s Lettuce (although I’m not sure why — it doesn’t resemble the Miner’s Lettuce plant at all), it was named for the eighteenth century Italian botanist Giuseppe Monti. 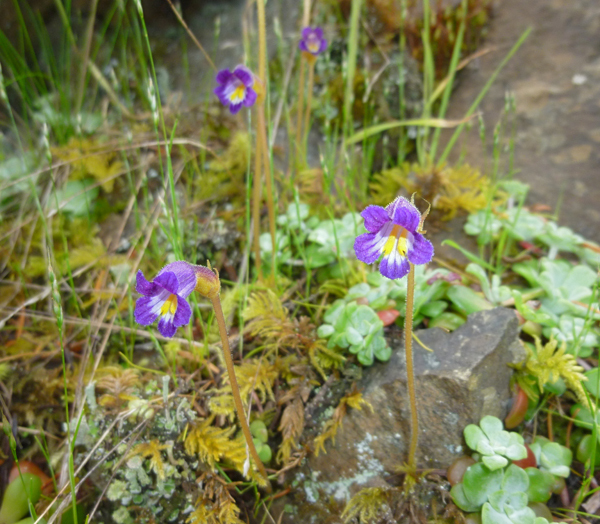 It likes moist areas and flourishes amidst mosses in rocky outcrops. One of my favorites! Get out your magnifier to appreciate this tiny annual. 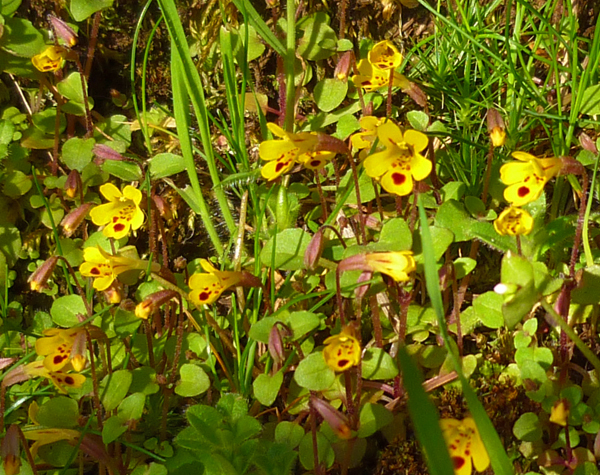 The small striking flowers are intense yellow with a prominent reddish landing spot to guide pollinators. They are prettier and daintier than their name suggests; monkey flowers are named after the grinning ape-like faces of the flowers. Also known as Wingstem Monkeyflower, it grows to a max height of 6 inches and likes moist rocky ledges. Another harsh-sounding name for a delicate beauty! I discovered this intriguing deep purple flower growing in a limited area amidst stonecrops, which it parasitizes in our area. A single yellow-throated flower blooms on a “naked” stem without leaves. The genus name Orobanch, from orobos (‘a clinging plant’) and ancho (‘to strangle’) alludes to its parasitic nature. There’s a British species that’s parasitic on Scotch Broom. 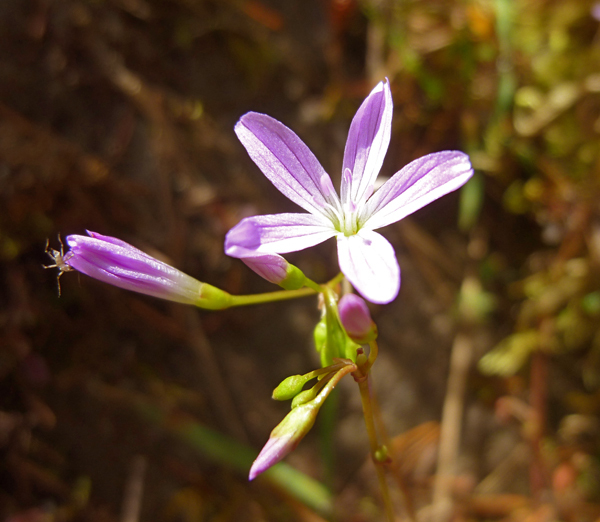 Appearing briefly in April and May, it seldom grows over four inches tall. These are just a few samples of our miniature native wildflowers worth appreciating. So slow down, and take notice! Approaching Yellow Island - an 11-acre preserve owned by the Nature Conservancy. What a gorgeous day for a paddle! 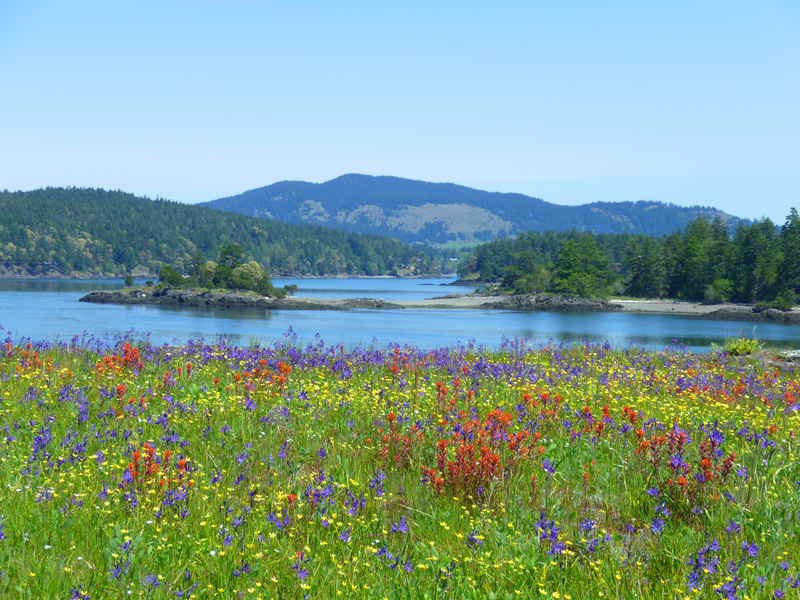 Yesterday I finally did one of the San Juan Islands’ must-dos: a tour of Yellow Island during the peak wildflower season. 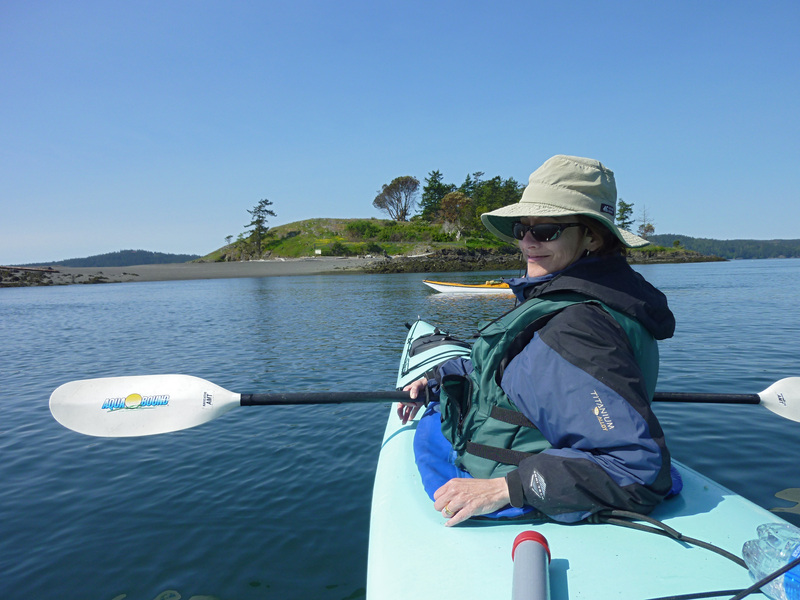 We hooked up with Jeff Zbornik, owner of Shearwater Kayaks, for an easy paddle from Deer Harbor. Wow! Now I know what everyone’s been raving about. The island’s caretaker, Phil, who has lived there in a driftwood cottage for 13 years, said this is the most spectacular spring he’s seen. The extra rain and cooler temps have extended the camas flowers by a month, synching blooms with Harsh Paintbrush and Buttercup. The result: a dizzying combo of purple-blue, red and yellow. 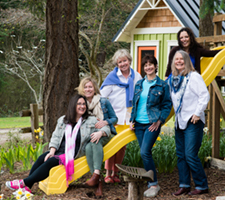 I hope to be posting a video soon; in the meantime you can see more photos at my husband’s website. 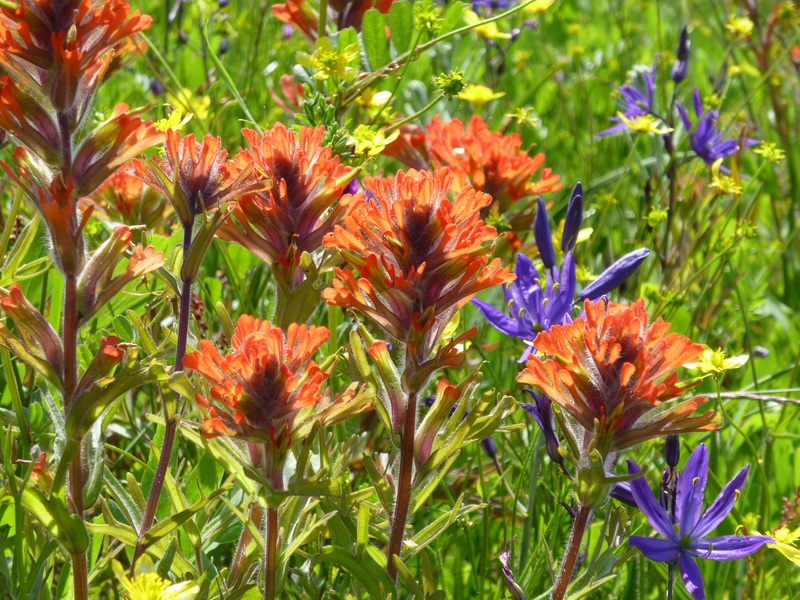 Harsh Paintbrush, Great Camas and Buttercup. Some of the Camas were waist-high! No food or drink allowed on the island. All of the surrounding islands are either private or off limits. But tiny McConnell Rock, just north of Yellow Island, is open to the public. Go at low tide so you can land on the spit that connects McConnell Rock and McConnell Island. To go ashore Yellow Island, use the south beach only.